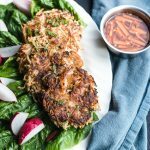 Paleo and Whole30 Shrimp & Sweet Potato Cakes Recipe served with a refreshing, slightly spicy dipping sauce! 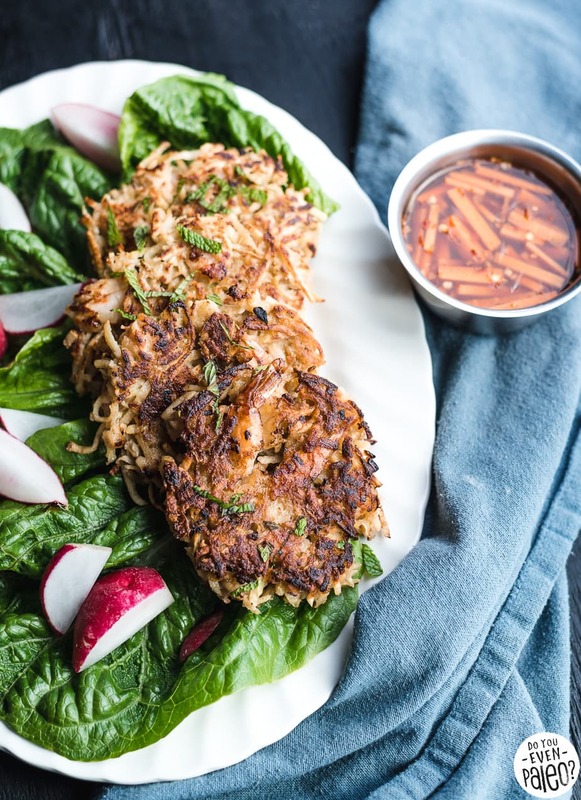 These Vietnamese-inspired beauties pack a whollop of flavor in each pan-fried cake. 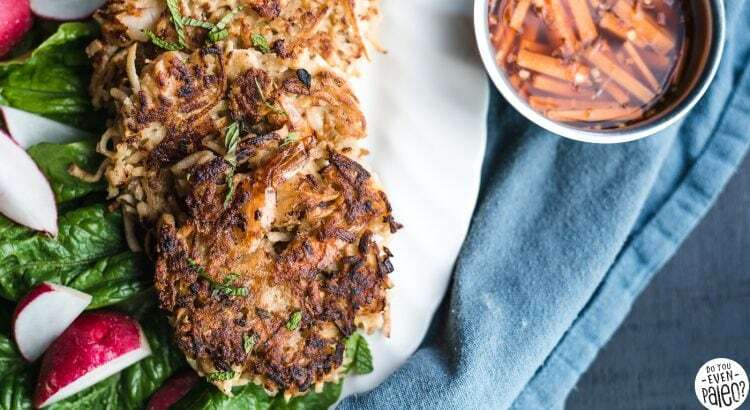 With meaty shrimp, delicately sweet white sweet potato, and a healthy glug or two of fish sauce, these Whole30 fritters are a total dream. I spend quite a bit of time in the kitchen (duh! ), so I’m always trying to push the envelope a bit. 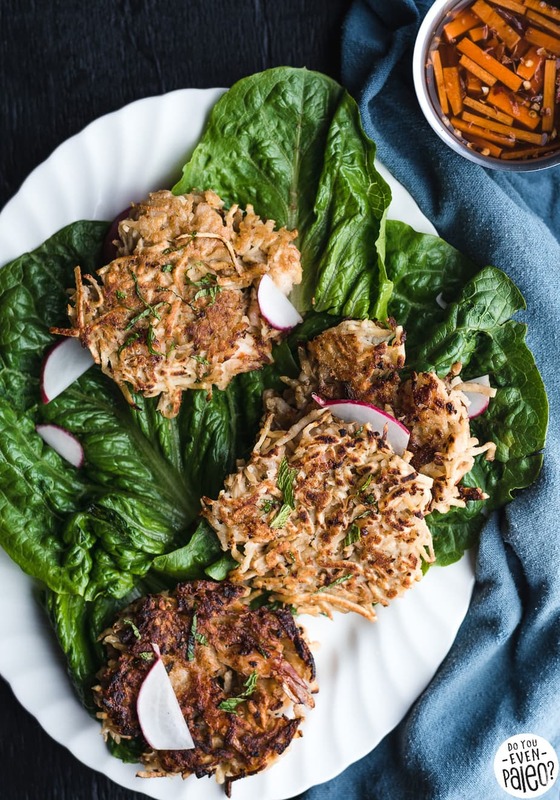 My goal is awesome recipes that make your tastebuds dance. I want people to truly enjoy the process of cooking like I do. Obviously, if the outcome is delicious, you’re probably going to like cooking just a little bit more. It’s not often that you’re proud of an untouched plate. So most of my kitchen experiments involve big flavor from the simplest of ingredients. Because it doesn’t have to be complicated to be awesome. These pan-fried shrimp & sweet potato cakes were borne from that goal. These little cakes use a handful of ingredients, but they deliver big time. I have a few tips for shrimp & sweet potato cake success, though. First, make sure to chop up those shrimps into 4-5 pieces each. Originally, I thought I could get away with leaving the shrimp whole. Nope. Not a chance. They just fell right out of the finished cakes. Then I tried adding an extra egg to get them to bind better. Again, didn’t work as intended. Really, you just have to chop up those shrimp. They don’t have to be crazy tiny or anything. Just make sure to chop ’em! Next, make the dipping sauce before you start on the sweet potato cakes. Just combine everything and let it sit. When left to marinate a little bit, the sauce transforms into a sweet and spicy little number. 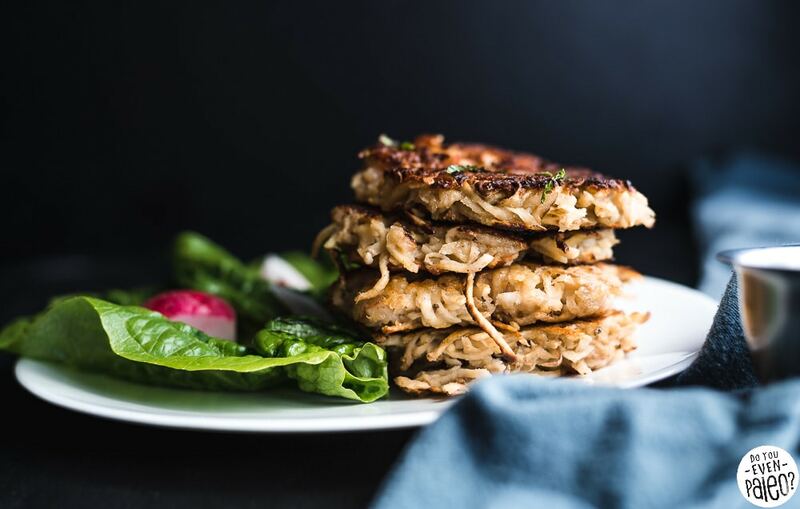 Give it a taste before you dig in to the sweet potato cakes, and add a little more crushed red pepper if you want more of a kick. But I’m telling you—don’t be too heavy-handed here! An extra 1/4 teaspoon does wonders. 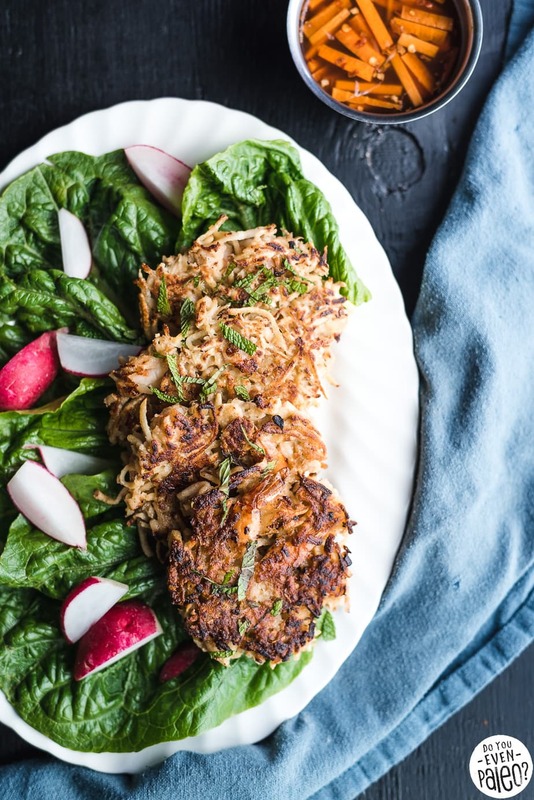 I’ve eaten these shrimp & sweet potato cakes with a side salad, and I’ve eaten them as PART of the salad (out of the box toppings for the win!) with the dipping sauce as a dressing, so feel free to flex your creativity muscle a bit with how you serve these. Combine coconut aminos, lime juice, rice vinegar, carrots, garlic clove, and red pepper flakes, whisking until smooth. 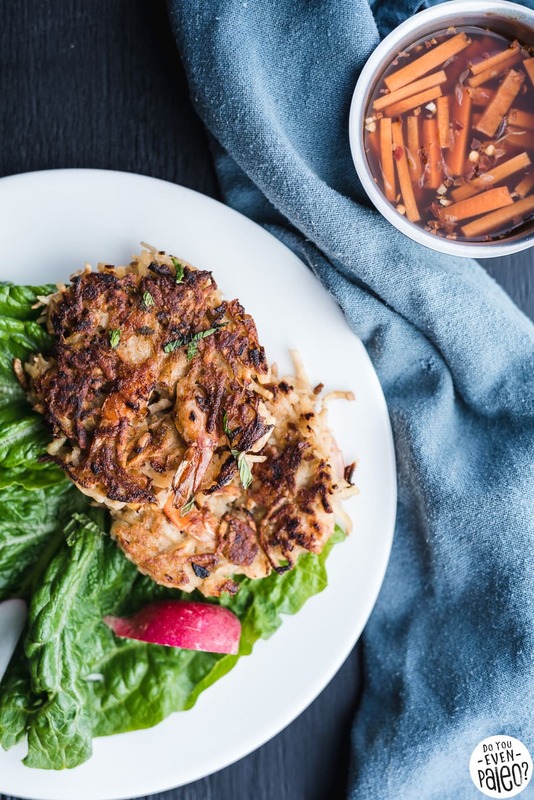 Set aside to let flavors meld while you prepare the shrimp & sweet potato cakes. Combine the grated sweet potato and salt in a bowl. Gently massage the sweet potato until the salt works its magic and the potato goes limp. Rinse and drain the sweet potato shreds, then squeeze out the excess moisture using a nut milk bag or paper towels. Add the sweet potato shreds, shrimp, and chopped shallots to a large bowl, stirring to combine. Stir in the arrowroot flour, cassava flour, black pepper, fish sauce, and egg. Shape the mixture into 8 individual potato cakes. Heat 2 tablespoons of olive oil in a large skillet over medium-high heat. Add 4 cakes to the pan and cook for 2 minutes on each side or until golden brown and crisp. Repeat with remaining 2 tablespoons of olive oil and sweet potato cakes. Serve the cakes with sauce, cilantro, and mint. Don't subscribe All Replies to my comments Notify me of followup comments via e-mail. You can also <a href='https://www.doyouevenpaleo.net/comment-subscriptions/?srp=3840&srk=87505361eee98908ddf6ccb8681f50d6&sra=s&srsrc=f'>subscribe</a> without commenting.